Aline Office Furniture was established in 1995 by former bank manager Ernie Armitage in Dublin. In the late 2000’s he opened his warehouse in Rathnew Co. Wicklow. Initially starting as an office supply company, Ernie identified good quality furniture from liquidation and lots of office furniture being sold very cheaply as a result. He also understood many SMEs had a need for office furniture to meet their budgets. He simply decided to marry supply with demand and bought as much used office furniture as he could afford and fit in his warehouse at the time. He repeated this process of buying and selling over the next 20 years, building his business from one man and one van to a thriving one now employing 5 people, a fleet of 4 vans, and 2 viewing warehouses in Dublin and Wicklow. Aline is Ireland’s leading independent retailer of office furniture, from brand new standard office furniture and high executive items to the good as new and bargain office furniture. Rental and furniture leasing is also available at Aline for events or conferences to training and short-term office leasing. We take great pride in our website and update weekly with new stock and special offers. Built from the ground up to be easy to use, easy to manage and be mobile friendly, you can place your orders directly on the website using our shopping basket. All products neatly tucked away into their own categories making them simple to find and compare. If you are using your mobile phone, you will find our website fits nicely into the palm of your hand. We’ve invested heavily in search engine optimisation to ensure our stock is found. See something you like, feel free to add it to your basket and checkout for next day delivery. We sell to companies and private individuals! 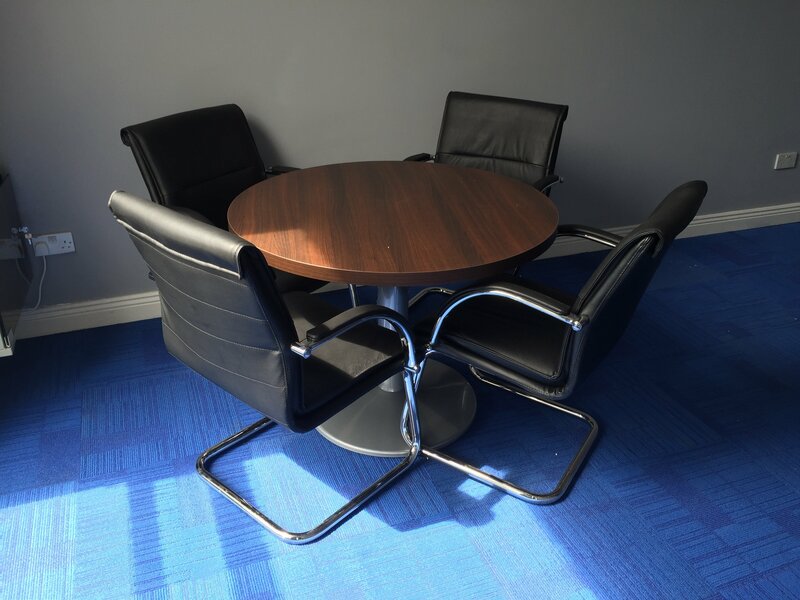 While we do stock top quality, premium new office furniture, we also stock good as new office furniture which we have bought from office closures and trade-ins. Whether you want reception desk or office furniture in premium colours or if you just want a plain old basic swivel chair, we can look after your every need when it comes to office furniture. You can call out to our warehouse/showroom in Greenogue Business Park to try out your furniture before you buy. Coming for South Leinster? Visit our warehouse in Rathnew, Co. Wicklow. If you are looking to rent office furniture for the short term or long term, please feel free to look at our sister office furniture rental website. Aline is owned and operated by Ernie Armitage. Ernie started Aline as an office supplies company in 2000. By 2007, he had focused the business primarily on office furniture. In that time he has expanded Aline from a one man and a van business to the limited company it is today. Richard is our primary installer, travelling the length and breadth of the country delivering our office furniture. He has an eye for detail and making sure that all our furniture is installed for their purpose. A former plasterer, Richard joined Aline on a part-time basis in 2010 and became permanent not long after. James started in the company in June 2013, beginning a Jobbridge internship with the Company. After rejuvenating traffic to the Website and contributing to sales, he earned a full-time job with the company in March 2014. He attend to the sales & office admin management including digital services but he is quite versatile, often out on deliveries and installations, when needed. James has a keen interest in the ergonomic design of office seating and willing to demonstrate all functions of our new and used office chairs. Like James, Karl joined Aline through the Jobridge scheme in October 2014. The artist in the company, he has grasped all corners of office furniture installations and in July 2015 was employed full time. Aline’s most recent recruit, Joe is the connection between the office and installation teams where he prepares orders and tends to our used office furniture, from repair to cleaning.